Well, it's official; we're no longer the descendents of the Hugs of Freiburg and Heiligenzell, Baden Wuerttemburg. Yesterday I got Great-Great-Grandfather William Hug's death record from New York City Vital Records, and his father was not Benedict Hug of Heiligenzell -- his father's name was Adolph, and we figured out the other day that they were from Hanover, not Baden. I knew I felt frustrated about all the time I spent on that branch (my most developed one!) -- hours online, hours in the Family History Center in Santa Cruz, hours writing posts about them, and so on. All that time down the drain. But what I didn't realize is how sad I would feel, saying goodbye to those people, because I had come to care so much about them and their lives. I know, I know, it sounds lame and maybe weird -- how could I get attached to people who lived hundreds of years ago? It's not like they lived in the house with us when we were growing up, like Grandma Sophie did. First of all, look how many ancestors are on that branch! And this isn't even all of them, because I couldn't fit the bottom generation before William onto the view on Ancestry. And I'm able to tell such great stories about some of them: how Landolin was born a short while before his parents were married and what that meant, how he worked in a vineyard, why Blasius was named the way he was, how Blasius might have seen Marie Antoinette when she stopped overnight on her way to France . . . . 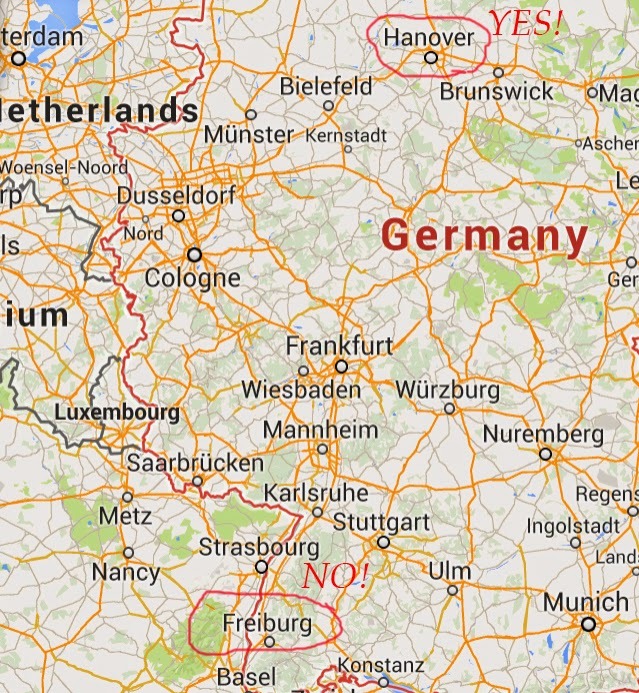 I loved having a great-etc.-grandmother named Salome, finding out that a Roman road went through Freiburg, on and on. And now . . . they're not our ancestors. We don't have an ancestral little house in the Black Forest. We can't brag about having had a mayor in the family. I'm bummed. I wish there were something I could do with this information! The only other person I know who's connected to this tree has it as a minor branch of her 3000 people that she's not all that interested in. I'd love to pass it on to someone who is really related to them. I considered deleting all the posts on that line, but I'm going to leave them, so that anyone who's searching for Blasius or Landolin or Sebastian or Constantine Hug will find them. If you're interested in reading, the Hug collection is here. Auf Wiedersehen, you Hugs -- it's been great knowing you. Disconnect and place them in a separate tree and perhaps someone will someday be searching this family and find the gold mine..
Great idea! Thanks, Claudia, for your comment.